Watch a beautiful christian lyrical dance performance combined with the beauty and inspiration of art and music. 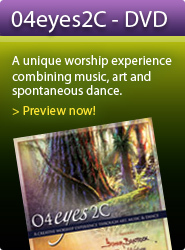 Those with an interest in combining art and dance with worship will find this is a unique and rewarding experience. Preview DVD trailer below. A dancer performs to the music of The Secret Place while a professional artist is painting before a live audience. Dance is an inspiring and beautiful art form. It captures people’s hearts and imaginations, and when used in a Christian context it can be a powerful tool in drawing others closer to Christ. Christian dance captures the imagination and reveals the creative heart of God. The church has been divided over the years on how christians should view dance, but God is restoring the arts to the Church. For many, many years, the Church has lain dormant while the secular world has been the ones to produce creativity and art. God is restoring the arts to the Church and we are beginning to discover new levels of creativity. We are created in the image of God who is the Creator. Creativity and art is a natural expression of a Christian’s heart to the Lord. We have a mandate from heaven to display the creativity and glory of God, and that includes the area of Christian dance. The first time the bible refers to someone being filled with the Spirit is in regard to the arts and being creative. The Lord anointed Bezalel with skill, ability and knowledge. Bezalel had a spirit of excellence and God blessed his ability in his art form. God loves creativity and He loves to see us excelling creatively in dance. As such, we should not take lightly God’s spirit resting on artists (musicians, singers, painters, dancers etc). God has filled them with His Spirit for a purpose; to bring glory to His name through the arts. People often have an emotional connection to music. How much more when the power of dance is added to that music? Christian lyrical dance stirs the heart of those who watch and evokes an emotional response and greater connection to God. Christian lyrical dance allows the expression and passion for God that we feel to be revealed through movement. Sometimes words are not enough to express our thanks or worship to God. Dance in these contexts is perfect for taking us into higher levels of worship and adoration toward God. Today we see Christian dance both within and outside the Church. When people see the creativity of God displayed through dance, their hearts connect to Him and they are drawn into a greater reality of who He is. Christian dance provides an excellent way to reach out to others within and outside the Church. It is a great evangelism tool for artistically portraying God to people and drawing them closer to the Father’s heart. Christian dance can be used to portray bible stories, messages of hope and salvation and many other ways that help connect others to Jesus. Because of its popularity as an evangelism and Christian outreach tool, many churches have started up Christian dance groups or a Christian ballet company. These ballet dancers come together to declare the glory of God through dance with a spirit of excellence. Dance is available to everyone, but there are those who professionally steward the gift and ability God has given them to be creative in dance.